The cell phone interface is very similar to the T68. It's very easy to use and I had no problems with it. I'll go through the menu of the phone, as well as describe each thing in the menus to give you a better understanding of the features of the phone. In my opinion, the main screen was very well done. On the bottom left is the signal strength. The bottom center displays the time, and the bottom right displays battery life. 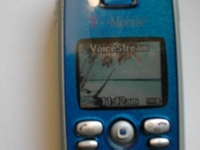 The top displays the cell phone carrier�s name, and in my case, it�s VoiceStream. When Infrared is activated, a little infrared icon shows up in the center right of the screen. The background image can be selected to whatever you want. There is 52 options pre-selected on the phone, but you can add more via optional CommuniCam Camera, Infrared, or using WAP. You can also activate a screensaver, but it�s pretty much pointless. It�s basically an image that shows up on the screen after a button has not been pressed for 25 seconds. About 3 seconds after that picture is displayed, a digital clock turns on, saving battery life. There is no way to turn off the clock, making the screensaver pretty much pointless.